Cecil Frank Cotton was a business manager for the Vancouver News-Advertiser and was later an insurance agent. He lived at 1950 Haro Street from 1902 to 1911. He was born in Lewisham, Kent, England on September 27, 1870. His father was Francis Lovett Cotton (later known as Francis Lovett Carter-Cotton) (1843-1919), who was a newspaperman, politician, and chancellor of the University of British Columbia. His mother was Maria Emily Little (1844-1937). In 1881, he was a student at Christ’s Hospital School in Hertford. In 1891, he was a bank clerk, living in London with his mother and her family. In 1893, he was living at 5 Pyrland Road in London. “England, London Electoral Registers, 1847-1913”, database with images, FamilySearch (https://familysearch.org/ark:/61903/1:1:QJNZ-GG84 : accessed 10 October 2015), Cecil Frank Cotton, 1893. 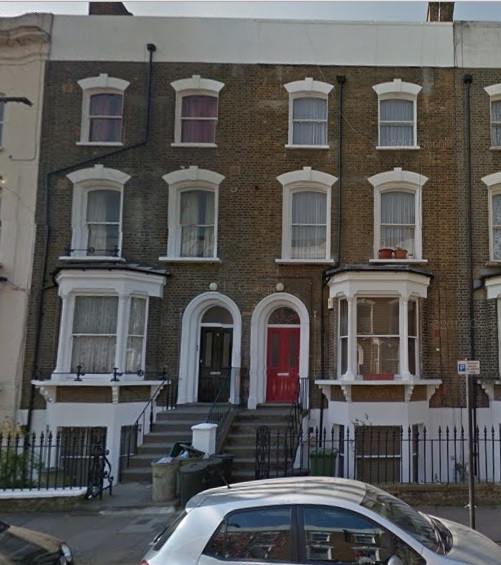 5 and 7 Pyrland Road, London, Google Streets, searched October 10, 2015. He first appeared in the Vancouver directory in 1897. He was living with his father in a house at the corner of Hastings Street and Seymour Street. Henderson’s BC Gazetteer and Directory, 1897, page 608. In 1901, he was living with his father. Before her marriage, Freda worked as a clerk at the Dominion Post Office. One of the wedding gifts was a silver tea service from the staff of the post office. After the wedding, Cecil and Freda went on a honeymoon trip. When they returned, they moved to 1950 Haro Street. They lived in this house until about 1911. Later they were at 1135 West 13th Avenue and at 2377 West Marine Drive. Cecil died in Vancouver on October 10, 1939. He was buried in Mountain View Cemetery in Vancouver. Freda died in Vancouver on March 29, 1968. It appears that Cecil and Freda did not have any children. Cecil had a brother and sister who lived in Vancouver. Arthur Harold (“Harry”) Cotton was born in Lewisham, Kent, England, on December 26, 1872. He became a newspaper editor, first for the Vancouver News-Advertiser, and later for the Vancouver Province. He married Genetta Charlotte Smith (1878-1947). Harry died in Vancouver on October 17, 1930. Genetta died in Vancouver on September 15, 1947. Eva never married. She died in Richmond, British Columbia, on June 8, 1962. She was buried in Ocean View Burial Park in Burnaby, British Columbia. Robert A. J. McDonald and H. Keith Ralston, “Carter-Cotton, Francis Lovett,” in Dictionary of Canadian Biography, vol. 14, University of Toronto/Université Laval, 2003–, accessed October 10, 2015, http://www.biographi.ca/en/bio/carter_cotton_francis_lovett_14E.html. Francis Lovett Carter-Cotton, Wikipedia article, https://en.wikipedia.org/wiki/Francis_Lovett_Carter-Cotton. Carter Cotton Building – 198 West Hastings; https://changingvancouver.wordpress.com/2012/01/16/carter-cotton-building/. The German Baron of early Vancouver; Francis Carter Cotton owned Vancouver’s first newspaper and was a provincial finance minister; By John Mackie, Vancouver Sun, October 8, 2015; http://www.vancouversun.com/German+Baron+early+Vancouver/11425092/story.html?__lsa=4564-3776. “England and Wales Birth Registration Index, 1837-2008,” database, FamilySearch (https://familysearch.org/ark:/61903/1:1:2NWR-BDF : accessed 10 October 2015), Francis Lovett Cotton, 1843; from “England & Wales Births, 1837-2006,” database, findmypast (http://www.findmypast.com : 2012); citing Birth Registration, Shoreditch, London, England, citing General Register Office, Southport, England. “England and Wales Marriage Registration Index, 1837-2005,” database, FamilySearch (https://familysearch.org/ark:/61903/1:1:2DKT-HMW : accessed 10 October 2015), Francis Lovett Cotton, 1868; from “England & Wales Marriages, 1837-2005,” database, findmypast (http://www.findmypast.com : 2012); citing Marriage, Hackney, London, England, General Register Office, Southport, England. “England and Wales Census, 1871”, database with images, FamilySearch (https://familysearch.org/ark:/61903/1:1:VB63-HLQ : accessed 10 October 2015), Francis L Cotton, 1871. “England, Kent, Register of Electors, 1570-1907,” database with images, FamilySearch (https://familysearch.org/ark:/61903/1:1:QJ8J-HW5G : accessed 10 October 2015), Francis Lovett Cotton, 1871; citing Lewisham, Sevenoaks, Kent, England, Kent Archives Office, Maidstone; FHL microfilm 1,537,604. “Canada Census, 1901,” database, FamilySearch (https://familysearch.org/ark:/61903/1:1:KHVJ-W8Y : accessed 10 October 2015), F Carton Cotton, D, Burrard, British Columbia, Canada; citing p. 16, Library and Archives of Canada, Ottawa; http://automatedgenealogy.com/census/View.jsp?id=59895&highlight=43&desc=1901+Census+of+Canada+page+containing+F.Carter+Cotton; http://data2.collectionscanada.ca/1901/z/z001/pdf/z000010362.pdf. “Recensement du Canada de 1911,” database, FamilySearch (https://familysearch.org/ark:/61903/1:1:QV95-MRZ4 : accessed 10 October 2015), Francis Carter-Colton, 1911; citing Census, Vancouver Sub-Districts 1-18, British Columbia, Canada, Library and Archives of Canada, Ottawa, Ontario; FHL microfilm 2,417,661; http://automatedgenealogy.com/census11/View.jsp?id=63768&highlight=5&desc=1911+Census+of+Canada+page+containing+Francis+Carter-Colton; http://data2.collectionscanada.gc.ca/1911/pdf/e001940147.pdf. “British Columbia Death Registrations, 1872-1986; 1992-1993”, database with images, FamilySearch (https://familysearch.org/ark:/61903/1:1:FL23-Z45 : accessed 10 October 2015), Francis Lovett Carter Cotton, 1919. Frank (Francis Lovet [sic]) Carter-Cotton, publisher, Greater Vancouver Book, 1997, pages 7815-816. “Carter-Cotton Dies at Home; End Comes to Pioneer Legislator, Educator and Newspaperman; Long Illness,” Vancouver Sun, November 21, 1919, pages1 and 10. (Includes photograph of F.L. Carter-Cotton). “Death Calls Noted Pioneer; Mr. F.L. Carter-Cotton Passes Away in His 76th Year; Journalist, Legislator, and firsth Chancellor of the University of B.C.,” Vancouver Province, November 21, 1919, page 4. (Includes photograph of Mr. F.L. Carter-Cotton). “Mr. Carter-Cotton’s Death Regretted at Harbor Offices,” Vancouver Province, November 21, 1919, page 27. “Final Tribute to F. Carter-Cotton,” Vancouver Province, November 24, 1919, page 21. “England Marriages, 1538–1973 ,” database, FamilySearch (https://familysearch.org/ark:/61903/1:1:NK53-2HW : accessed 10 October 2015), Joseph Little and Maria Artis, 31 Dec 1836; citing Old Church,Saint Pancras,London,England, reference ; FHL microfilm 598,186, 598,187, 598,188, 598,189, 598,336, 598,337, 598,338, 598,339, 598,340. (parents of Maria Emily Little). “England and Wales Birth Registration Index, 1837-2008,” database, FamilySearch (https://familysearch.org/ark:/61903/1:1:26B8-86G : accessed 10 October 2015), Maria Emily Little, 1845; from “England & Wales Births, 1837-2006,” database, findmypast (http://www.findmypast.com : 2012); citing Birth Registration, London City, London, England, citing General Register Office, Southport, England. “England and Wales Census, 1851,” database, FamilySearch (https://familysearch.org/ark:/61903/1:1:SG6B-S18 : accessed 10 October 2015), Maria E Little, ; from “1851 England, Scotland and Wales census,” database and images, findmypast (http://www.findmypast.com : n.d.); citing PRO HO 107, The National Archives of the UK, Kew, Surrey. “England and Wales Census 1881,” database with images, FamilySearch (https://familysearch.org/ark:/61903/1:1:QK6R-DCYX : accessed 10 October 2015), Maria E Cotton in household of Marie Little, Islington, London,Middlesex, England; from “1881 England, Scotland and Wales census,” database and images, findmypast (http://www.findmypast.com : n.d.); citing p. 53, Piece/Folio 249/29, The National Archives, Kew, Surrey; FHL microfilm 101,774,223. “England and Wales Census, 1891,” database with images, FamilySearch (https://familysearch.org/ark:/61903/1:1:3R8C-KW2 : accessed 10 October 2015), Maria E Cotton, Islington, London, England; from “1891 England, Scotland and Wales census,” database and images, findmypast (http://www.findmypast.com : n.d.); citing PRO RG 12, London county, subdistrict, The National Archives of the UK, Kew, Surrey. “England and Wales Census, 1901,” database, FamilySearch (https://familysearch.org/ark:/61903/1:1:X9DG-4L9 : accessed 10 October 2015), Maria E Cotton, Islington, London, Middlesex, England; from “1901 England, Scotland and Wales census,” database and images, findmypast (http://www.findmypast.com : n.d.); citing Highbury subdistrict, PRO RG 13, The National Archives, Kew, Surrey. “Recensement du Canada de 1911,” database, FamilySearch (https://familysearch.org/ark:/61903/1:1:QV95-MRZH : accessed 10 October 2015), Mariam E Carter-Colton in entry for Francis Carter-Colton, 1911; citing Census, Vancouver Sub-Districts 1-18, British Columbia, Canada, Library and Archives of Canada, Ottawa, Ontario; FHL microfilm 2,417,661; http://automatedgenealogy.com/census11/View.jsp?id=63768&highlight=6&desc=1911+Census+of+Canada+page+containing+Marian+E+Carter-Colton; http://data2.collectionscanada.gc.ca/1911/pdf/e001940147.pdf. 1921 Canada Census, Mariah E. Cotton, Reference Number: RG 31; Folder Number: 18; Census Place: Ward 1, Vancouver Centre, British Columbia; Page Number: 10; Ancestry.com. 1921 Census of Canada [database on-line]. Provo, UT, USA: Ancestry.com Operations Inc, 2013. “British Columbia Death Registrations, 1872-1986; 1992-1993”, database with images, FamilySearch (https://familysearch.org/ark:/61903/1:1:FL2J-96T : accessed 10 October 2015), Maria Emily Carter-Cotton, 1937. “One of Vancouver’s oldest residents died Monday in the person of Mrs. Maria Emily Carter-Cotton, widow of the late F.L. Carter-Cotton, in her ninety-third year. The family residence is at 935 West Thirteenth. Mrs. Cotton was born in London, and had resided in Vancouver since 1909. She leaves a son, Cecil F. Cotton, and a daughter, Miss Winnifred, a granddaughter, Miss Frances Cotton, and two daughters-in-law, Mrs. C.F. Cotton and Mrs. A.H. Cotton. In the late nineties and early years of the present century, the late Mr. Cotton was publisher of the News-Advertiser and he erected the building now occupied by The Daily Province. He was at one time a member of the Legislature and a cabinet minister. “England and Wales Birth Registration Index, 1837-2008,” database, FamilySearch (https://familysearch.org/ark:/61903/1:1:2XW4-1VN : accessed 10 October 2015), Cecil Frank Cotton, 1870; from “England & Wales Births, 1837-2006,” database, findmypast (http://www.findmypast.com : 2012); citing Birth Registration, Lewisham, London, England, citing General Register Office, Southport, England. “England and Wales Census, 1871”, database with images, FamilySearch (https://familysearch.org/ark:/61903/1:1:VB63-HLW : accessed 10 October 2015), Cecil F Cotton in entry for Maria E Cotton, 1871. “England and Wales Census 1881,” database with images, FamilySearch (https://familysearch.org/ark:/61903/1:1:QKXS-X1WY : accessed 10 October 2015), Cecil F Cotton, Hertford St John, Hertfordshire, England; from “1881 England, Scotland and Wales census,” database and images, findmypast (http://www.findmypast.com : n.d.); citing p. 1, Piece/Folio 1425/108, The National Archives, Kew, Surrey; FHL microfilm 101,774,598. The Boys of Christ’s Hospital School, Hertford, in 1881, http://www.hertfordshire-genealogy.co.uk/data/education/hertford-christs-hospital-boys.htm; “Cecil F. Cotton, [age] 10; Blackheath, Kent. Christ’s Hospital School, Hertford, http://www.hertfordshire-genealogy.co.uk/data/education/hertford-christs-hospital.htm. “England and Wales Census, 1891,” database with images, FamilySearch (https://familysearch.org/ark:/61903/1:1:3R8C-L6Z : accessed 10 October 2015), Cecil F Cotton, Islington, London, England; from “1891 England, Scotland and Wales census,” database and images, findmypast (http://www.findmypast.com : n.d.); citing PRO RG 12, London county, subdistrict, The National Archives of the UK, Kew, Surrey. “England, London Electoral Registers, 1847-1913”, database with images, FamilySearch (https://familysearch.org/ark:/61903/1:1:QJNQ-WYS5 : accessed 10 October 2015), Cecil Frank Cotton, 1894. “England, London Electoral Registers, 1847-1913”, database with images, FamilySearch (https://familysearch.org/ark:/61903/1:1:QJNQ-WYSS : accessed 10 October 2015), Cecil Frank Cotton, 1894. “British Columbia Marriage Registrations, 1859-1932; 1937,” database with images, FamilySearch (https://familysearch.org/ark:/61903/1:1:JD8B-PDN : accessed 10 October 2015), Cecil Frank Cotton and Eva Winifred Stitt, 15 Jul 1902; citing , British Columbia, Canada, British Columbia Archives film number B11373, Vital Statistics Agency, Victoria; FHL microfilm 1,983,530. “Recensement du Canada de 1911,” database, FamilySearch (https://familysearch.org/ark:/61903/1:1:QV95-MLFN : accessed 11 October 2015), Cecil Frank Cistton, 1911; citing Census, Vancouver Sub-Districts 1-18, British Columbia, Canada, Library and Archives of Canada, Ottawa, Ontario; FHL microfilm 2,417,661; http://automatedgenealogy.com/census11/View.jsp?id=63700&highlight=24&desc=1911+Census+of+Canada+page+containing+Cecil+Frank+Cotton; http://data2.collectionscanada.gc.ca/1911/pdf/e001940077.pdf. 1921 Canada Census, Cecil Frank Cotton, Reference Number: RG 31; Folder Number: 19; Census Place: Point Grey (Municipality), Vancouver South, British Columbia; Page Number: 20; Ancestry.com. 1921 Census of Canada [database on-line]. Provo, UT, USA: Ancestry.com Operations Inc, 2013. “British Columbia Death Registrations, 1872-1986; 1992-1993”, database with images, FamilySearch (https://familysearch.org/ark:/61903/1:1:FLV5-QDC : accessed 10 October 2015), Cecil Frank Cotton, 1939. 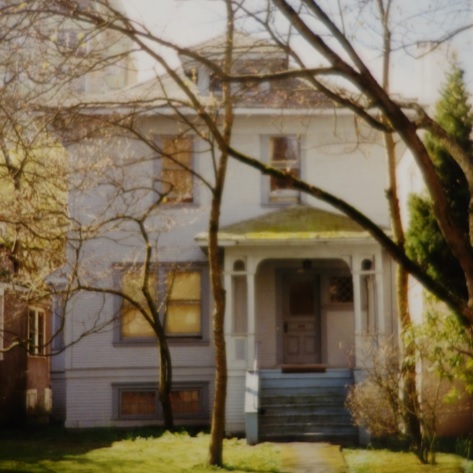 “Cecil Frank Cotton, 67, resident of Vancouver for nearly half a century, died today at his home, 2377 West Marine Drive. Mr. Cotton, son of Francis Lacey [sic] Carter-Cotton, founder the Vancouver News-Advertiser, was born in London, England. He came to Vancouver more than 45 years ago and for several years was business manager of The News-Advertiser. He was predeceased by his younger brother, Harry Cotton, who, about, 40 years ago, was city editor of the paper. Surviving are his wife; one sister, Miss E.W. Carter-Cotton; one niece, Miss Frances Carter-Cotton. Funeral services will be conducted in St. Mary’s Anglican Church, Thirty-seventh Avenue at Larch, by Rev. J.H. Craig at 2:30 p.m. Thursday; interment, Mountain View Cemetery. “Ontario Marriages, 1869-1927,” database with images, FamilySearch (https://familysearch.org/ark:/61903/1:1:FMF1-T84 : accessed 10 October 2015), John R Stitt and Isabella A Lesueur, 13 Feb 1873; citing registration , Ottawa, Ontario, Canada, Archives of Ontario, Toronto; FHL microfilm 1,862,700. “Canada Census, 1901,” database, FamilySearch (https://familysearch.org/ark:/61903/1:1:KHVN-GKD : accessed 11 October 2015), John Stitt, D, Burrard, British Columbia, Canada; citing p. 8, Library and Archives of Canada, Ottawa; http://automatedgenealogy.com/census/View.jsp?id=59808&highlight=20&desc=1901+Census+of+Canada+page+containing+John+Stitt; http://data2.collectionscanada.ca/1901/z/z001/pdf/z000010251.pdf. “British Columbia Death Registrations, 1872-1986; 1992-1993”, database with images, FamilySearch (https://familysearch.org/ark:/61903/1:1:FLKC-GM8 : accessed 10 October 2015), John Roland Stitt, 1907. “Find A Grave Index,” database, FamilySearch (https://familysearch.org/ark:/61903/1:1:QVV5-724L : accessed 10 October 2015), Jno. R. Stitt, 1907; Burial, Vancouver, Greater Vancouver Regional District, British Columbia, Canada, Mountain View Cemetery; citing record ID 26307353, Find a Grave, http://www.findagrave.com/cgi-bin/fg.cgi?page=gr&GRid=26307353. “British Columbia Death Registrations, 1872-1986; 1992-1993”, database with images, FamilySearch (https://familysearch.org/ark:/61903/1:1:FL26-FL7 : accessed 10 October 2015), Isabella Hay Stitt, 1932. “Find A Grave Index,” database, FamilySearch (https://familysearch.org/ark:/61903/1:1:QVV5-724N : accessed 10 October 2015), Isabella May Stitt, 1932; Burial, Vancouver, Greater Vancouver Regional District, British Columbia, Canada, Mountain View Cemetery; citing record ID 26307355, Find a Grave, http://www.findagrave.com/cgi-bin/fg.cgi?page=gr&GRid=26307355. “Canada Births and Baptisms, 1661-1959,” database, FamilySearch (https://familysearch.org/ark:/61903/1:1:F2JV-WD9 : accessed 10 October 2015), Eva Winifred Stitt, 23 Dec 1876; citing Nepean Township, Carleton, Ontario, 23 Dec 1876, reference cn 3321; FHL microfilm 1,845,220. “Ontario Births, 1869-1912”, database with images, FamilySearch (https://familysearch.org/ark:/61903/1:1:FM82-MYY : accessed 10 October 2015), Eva Winifred Stitt, 1876. 1921 Canada Census, Eva Winifred Cotton, Reference Number: RG 31; Folder Number: 19; Census Place: Point Grey (Municipality), Vancouver South, British Columbia; Page Number: 20; Ancestry.com. 1921 Census of Canada [database on-line]. Provo, UT, USA: Ancestry.com Operations Inc, 2013. “British Columbia Death Registrations, 1872-1986; 1992-1993”, database with images, FamilySearch (https://familysearch.org/ark:/61903/1:1:FLY6-PTP : accessed 10 October 2015), Eva Winnifred Carter-Cotton, 1968. “England and Wales Birth Registration Index, 1837-2008,” database, FamilySearch (https://familysearch.org/ark:/61903/1:1:2XCF-GR4 : accessed 10 October 2015), Arthur Harold Cotton, 1873; from “England & Wales Births, 1837-2006,” database, findmypast (http://www.findmypast.com : 2012); citing Birth Registration, Lewisham, London, England, citing General Register Office, Southport, England. “England and Wales Census 1881,” database with images, FamilySearch (https://familysearch.org/ark:/61903/1:1:QK6R-DCYF : accessed 10 October 2015), Arthur H Cotton in household of Marie Little, Islington, London,Middlesex, England; from “1881 England, Scotland and Wales census,” database and images, findmypast (http://www.findmypast.com : n.d.); citing p. 53, Piece/Folio 249/29, The National Archives, Kew, Surrey; FHL microfilm 101,774,223. “England and Wales Census, 1901,” database, FamilySearch (https://familysearch.org/ark:/61903/1:1:X9DG-4LS : accessed 10 October 2015), Arthur H Cotton in household of Maria E Cotton, Islington, London, Middlesex, England; from “1901 England, Scotland and Wales census,” database and images, findmypast (http://www.findmypast.com : n.d.); citing Highbury subdistrict, PRO RG 13, The National Archives, Kew, Surrey. “British Columbia Marriage Registrations, 1859-1932; 1937,” database with images, FamilySearch (https://familysearch.org/ark:/61903/1:1:JD8V-YHD : accessed 10 October 2015), Arthur Harold Cotton and Genetta Charlotte Leighton, 15 Sep 1915; citing Kamloops, British Columbia, Canada, British Columbia Archives film number B11384, Vital Statistics Agency, Victoria; FHL microfilm 1,983,977. “British Columbia Death Registrations, 1872-1986; 1992-1993”, database with images, FamilySearch (https://familysearch.org/ark:/61903/1:1:FLGX-MRP : accessed 10 October 2015), Arthur Harold Cotton, 1930. “British Columbia Death Registrations, 1872-1986; 1992-1993”, database with images, FamilySearch (https://familysearch.org/ark:/61903/1:1:FLRP-827 : accessed 10 October 2015), Nettie Charlotte Cotton, 1947. British Columbia Death Registrations, Registration Number: 1992-09-023849; Frances Mary Winifred Vey; age: 76; date of death: December 26, 1992; place of death: Burnaby; http://search-collections.royalbcmuseum.bc.ca/Genealogy/DisplayGenealogyImage?k=0fa58d34-0d68-4e65-ae69-9f1722e68c6e; medical certificate of death: http://search-collections.royalbcmuseum.bc.ca/Genealogy/DisplayGenealogyImage?k=98f31ab6-48a7-45dc-b0b1-7ae215490df8. “England and Wales Birth Registration Index, 1837-2008,” database, FamilySearch (https://familysearch.org/ark:/61903/1:1:2X8T-56G : accessed 10 October 2015), Eva Winifred Cotton, 1875; from “England & Wales Births, 1837-2006,” database, findmypast (http://www.findmypast.com : 2012); citing Birth Registration, Lewisham, London, England, citing General Register Office, Southport, England. “England and Wales Census 1881,” database with images, FamilySearch (https://familysearch.org/ark:/61903/1:1:QK6R-DCYN : accessed 10 October 2015), Eva W Cotton in household of Marie Little, Islington, London,Middlesex, England; from “1881 England, Scotland and Wales census,” database and images, findmypast (http://www.findmypast.com : n.d.); citing p. 53, Piece/Folio 249/29, The National Archives, Kew, Surrey; FHL microfilm 101,774,223. “England and Wales Census, 1891,” database with images, FamilySearch (https://familysearch.org/ark:/61903/1:1:3R8C-GPZ : accessed 10 October 2015), Eva W Cotton, Islington, London, England; from “1891 England, Scotland and Wales census,” database and images, findmypast (http://www.findmypast.com : n.d.); citing PRO RG 12, London county, subdistrict, The National Archives of the UK, Kew, Surrey. “England and Wales Census, 1901,” database, FamilySearch (https://familysearch.org/ark:/61903/1:1:X9DG-4L3 : accessed 10 October 2015), Eva W Cotton in household of Maria E Cotton, Islington, London, Middlesex, England; from “1901 England, Scotland and Wales census,” database and images, findmypast (http://www.findmypast.com : n.d.); citing Highbury subdistrict, PRO RG 13, The National Archives, Kew, Surrey. “Recensement du Canada de 1911,” database, FamilySearch (https://familysearch.org/ark:/61903/1:1:QV95-MRZC : accessed 10 October 2015), Eva W Carter-Colton in entry for Francis Carter-Colton, 1911; citing Census, Vancouver Sub-Districts 1-18, British Columbia, Canada, Library and Archives of Canada, Ottawa, Ontario; FHL microfilm 2,417,661; http://automatedgenealogy.com/census11/View.jsp?id=63768&highlight=7&desc=1911+Census+of+Canada+page+containing+Eva+W+Carter-Colton; http://data2.collectionscanada.gc.ca/1911/pdf/e001940147.pdf. 1921 Canada Census, Eva Winnifred Cotton, Reference Number: RG 31; Folder Number: 18; Census Place: Ward 1, Vancouver Centre, British Columbia; Page Number: 10; Ancestry.com. 1921 Census of Canada [database on-line]. Provo, UT, USA: Ancestry.com Operations Inc, 2013. “British Columbia Death Registrations, 1872-1986; 1992-1993”, database with images, FamilySearch (https://familysearch.org/ark:/61903/1:1:FLT8-D4C : accessed 10 October 2015), Eva Winifred Carter-Cotton, 1962.